Electronics is the study an uise o electrical components an circuits that controls the flowe o electrons or ither electrically chairged pairticles. The fairmaist components uised in electronics is resistors, capacitors, an ticht or lowse wund hanks o wire cried inductors. Aulder electronics uised gless or metal vacuum tubes for tae control the flowe o electrons. By the late 1960's an early 1970's the transistor, a semiconductor, begoud tae tak the steid o vacuum tubes as control components. At aboot the same time, integratit circuits (meeniatur semicondutor circuits conteenin lairge nummers o awfu wee transistors pitten on gey an thin skelfs o seelicon) cam intae ordinar uiss. 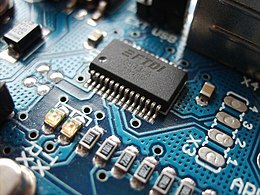 Integratit circuits made it possible tae seegnificantly reduce the nummer o components needit tae mak electronic products. Some electronic circuits process an caw aboot information. Thir are communications seestems. Ither electronic circuits converts an distributes energy. Thir are control seestems. Inpits - Electrical or mechanical sensors (or transducers) that taks seegnals (in the form o temperatur, pressur, etc.) frae the pheesical warld an converts them intae current an voltage seegnals. Seegnal processin circuits - Thir conseests o electronic components connectit thegether for tae manipulate, interpret an transform the information conteened in the seegnals. Ootpits - Actuators or ither devices (transducers an aw) that transforms current an voltage seegnals back intae uissefu pheesical form. Tak as an example a televeesion set. A televeesion set's inpit is a braidcast seegnal received frae an antenna, or a wire cable providit by a cable televeesion vendor. Seegnal processin circuits inside the televeesion set uises the brichtness, colour, an soond information athin the received seegnal tae control the televeesion set's ootput devices. The display ootpit device micht be a cathode ray tube (CRT) or a plasma or liquid creestal display screen. The audio ootpit device micht be a magnet driven audio speaker. The display ootput devices converts the seegnal processin circuits' brichtness an colour information intae the veesible eemage displayed on a screen. The audio ootput device converts the processed soond information intae soonds that can be heard by listeners. Analog circuits is used for signals that has a renege o amplitudes. For o dinar, analog circuits messieurs or controls the amplitude o signals. &tbsp;In the early days o electronics, aw electronic devices used analog circuits for signal procession an control. Pulse circuits is uised for seegnals that requires swith pulses o energy. For example, aircraft an grund radar equipment wirks by uisin pulse circuits for tae create an send heich pouered brusts o radio energy frae radar transmeeters. Special antennas (cried "bauk" or "dish" antennas acause o their shape) is uised for tae send the heich pouered brusts in the airt the bauk or dish antenna is pyntit. The radar transmeeter's pulses or brusts o radio energy hit an stot back frae haurd an metallic objects. Haurd objects is things like biggins, hills, an muntains. Metallic objects is ocht made o metal, like aircraft, brigs, satellites, or e'en objects in space. The reflectit radar energy is detectit by radar pulse receivers that uises baith pulse an deegital circuits thegither. The pulse an deegital circuits in radar pulse receivers is uised for tae shaw the location an distance o objects that haes reflectit the radar transmeeter's heich pouered pulses. By controllin hou aften the rapid pulses o radar energy is sent oot by a radar transmeeter (cried the transmeeter's "pulse timin"), an hou lang it taks for the reflectit pulse energy tae come back tae the radar receiver, a body can tell no juist whaur objects is, but hou faur awa they are. Deegitial circuits in a radar receiver calculates the distance tae an object by knawin the time interval atween energy pulses. The radar receiver's deegital circuits coonts hou lang it taks atween pulses for an object's reflectit energy tae be detectit by the radar receiver. Syne radar pulses ais sent an received at aboot the speed o licht, the distance tae an object can be easy calculate. This is duin in deegital circuits by dividin the speed o licht by the time it taks tae receive the radar energy reflecteit back frae an object. The time atween pulses (aften cried "pulse rate time", or PRT) sets the leemit on hou faur awa an object can be detectit. That distance is cried the "reenge" o a radar transmeeter an receiver. Radar transmeeters an receivers uises lang PRT's for tae find the distance tae objects that's faur awa. Lang PRT's maks it possible tae accurately determine the distance tae the muin, for example. Fast PRT's is uised for tae detect objects that's a hail sicht closer, like ships at sea, hie fleein aircraft, or for tae determine the speed o fast muivin caurs on motorweys. Deegital circuits is uised for seegnals that aye turns on an aff. Active components in deegital citcuits for ordinar haes a constant amplitude whan turnt on, an zero amplitude whan turnt aff. Tae the maist pairt, deegital circuits coont the nummer o times a component is sneckit on an aff. Computers an electronic clocks is examples o electronic devices that's maistly made o deegital circuits. Wikimedia Commons haes media relatit tae Electronics. This page wis last eeditit on 3 August 2017, at 00:39.